Is baking a horizontal loaf of bread important to you? Then you will want to make sure the bread machine you purchase bakes a horizontal loaf! Some people don’t realize this but bread machines make loaves of bread in all shapes and sizes. Many assume that a bread maker will bake a traditional loaf like the ones you get at the supermarket. But in reality, bread size can be anywhere from 1 to 3 pounds and shapes can be anything from horizontal to vertical. Why? It all comes down to space. Bread machines that make horizontal loaves take space, so some manufacturers change the shape – often vertically – to better suit small kitchen spaces. It’s the same reason why densely populated cities have mainly high rises. How do you pick a bread machine that makes a horizontal loaf? It’s hard to tell from the exterior, because the baking pan that is inside is the thing that makes the loaf horizontal. To help you choose one, we put together a list of the best horizontal bread machines based on our reviews and the ratings of other customers. 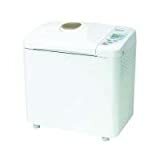 The Zojirushi BB-PDC20 bakes a delicious traditional loaf of bread and more. It has dual kneading blades which is ideal for thorough kneading. There are plenty of pre-programmed settings including one for gluten-free bread. You don’t have to wait for your ingredients to come to the correct temperature since the machine is smart enough to do that for you. Just insert the ingredients and push the buttons. The machine performs well no matter what you are making and feels like a high-end machine. But the main reason why we chose this as our top pick for making horizontal bread is the heater on the lid, which makes a perfectly crusted horizontal loaf. It’s what sets this machine apart from the rest. Read our full Zojirushi BB-PDC20 review here. The Zojirushi BB-CEC20 is almost identical to the Zojirushi BB-PDC20 that we wrote about above. It’s an earlier model but we still love it because it bakes a nice delicious horizontal loaf of bread. This model has a large viewing window and is a well-made and sturdy machine. It has dual kneading blades as well. But it doesn’t have a heater on the lid, so if you like darker crusts go for the BB-PDC20 and if you enjoy lighter crusts choose this BB-CEC20. Either way, whichever Zojirushi you get, you’ll be making delicious horizontal loaves. That’s because the temperature control and quality of Zojirushi is in its own class. The Panasonic SD-YD250 will make a horizontal loaf, but not in the traditional sense. It features a tall baking pan so your loaf might come out a little taller than usual. Still, we really like the Panasonic SD-YD250 for its features. For instance, it has a dedicated automatic yeast dispenser that will add yeast at the precise moment. This is a truly under-appreciated function because yeast makes a huge difference in how delicious your bread will be. Plus it bakes bread as little as 1.5 pounds to as large as 2.5 pounds. Once you use the Panasonic SD-YD250 you will learn to appreciate the attention to detail Panasonic has put into its bread machine. It rounds out the top 3 on our list because in addition to its functions, it’s incredibly affordable, priced just above $100 online. Check out our complete review of this bread machine here. The loaf will be horizontal but a little shorter in length with the T-fal PF311. We love this bread machine because it’s quite versatile. It can bake a 1-pound, 1.5-pound, and 2-pound loaf. It has a 15-hour delay timer and 15 pre-programmed settings including 3 gluten-free settings. And its replacement parts are reasonably priced. This is one of those machines that will work for most people. The Cuisinart CBK-100 is a good choice for those looking for a solid horizontal bread machine minus the fancy features of Zojirushi and Panasonic. It is perfect for small families since it can make a small 1-pound loaf, yet equally perfect for large families with a 2-pound loaf capacity. While it doesn’t have fancy dispensers, the machine has an alarm that sounds to let you know when the time is right to add extra ingredients. It’s an all-around quality bread machine. Read our thoughts about it in more detail here.